Sönke Bartling, founder of Blockchain For Science and associated researcher at the Humbold institute for internet and society, is interested in developing and describing novel online tools and concepts for knowledge creation. In addition to being a board-certified radiologist with a broad clinical experience and a researcher in basic medical imaging sciences, Sönke has co-editing the living book, http://www.openingscience.org/. He is currently organizing the 1st International Conference on Blockchain For Science and Knowledge Creation in Berlin. Below, he shares his own views on the blockchain revolution and what it could mean for science and knowledge creation. In today’s day and age, our digital lives are replete with databases, or centralized, online server-based information systems, that hold and record data. Facebook, for example, is a sort of database for our social activity, in the same way that we could think of online banking as a database for our savings and financial transactions. For better or worse, we as consumers take for granted that these service providers will not unduly manipulate what’s in the database – our number of Facebook ‘Likes’ or our checking account balance – but with the advent of blockchain, this doesn’t have to be the case. Instead of using passwords for logging into services that are centrally managed by the provider, users could maintain their autonomy by way of a unique private digital key used to authorize transactions, or changes to the database. So, what is blockchain? In many ways, it’s an online database, but with special characteristics. Namely, it’s distributed and decentralized, so it doesn’t run on one computer but rather on several, so there’s no single source that could be targeted to disrupt the service. It’s also immutable, meaning that it can’t be changed arbitrarily, and any and all changes to the database are recorded, so that they can be tracked and followed, producing a public, provable, cryptographic ledger of transactions. In this same vein, blockchain also has significant implications for controlling user accounts. Instead of using passwords for logging into services that are centrally managed by the provider, users could maintain their autonomy by way of a unique private digital key used to authorize transactions, or changes to the database. So, what might a scientific database application for blockchain look like? 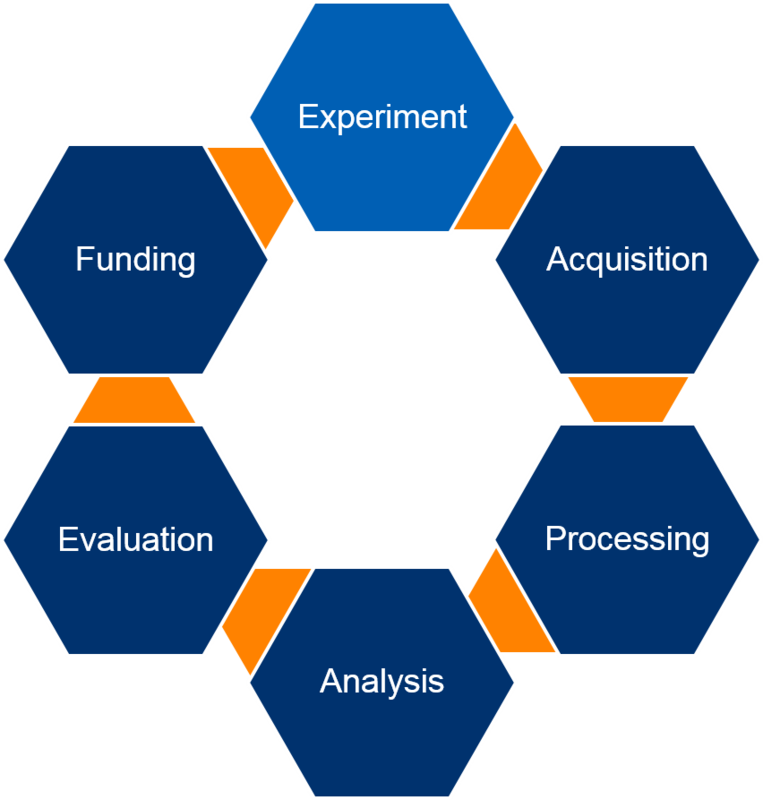 We’re all familiar with the research cycle: first, researchers conduct an experiment to acquire data, which they then process and analyze to produce a publication. 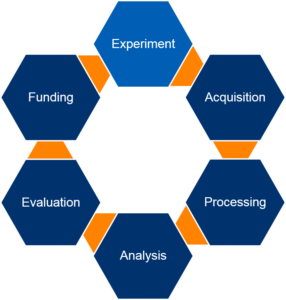 The article or research artifact is evaluated, and then funding is allocated accordingly so that the next subsequent experiment can be initiated. In this traditional process, the science only becomes accessible to the wider world once the article is published. While more recent developments like open data initiatives move this transparency forward somewhat to the analysis phase, blockchain has the potential to exponentially increase openness across the entire research cycle, starting with study registration and data acquisition. Research data could be deposited in an immutable, time-stamped blockchain database, encouraging scientists to be more objective about the information they collect and potentially enhancing reproducibility. Post-processing analysis could also be governed by blockchain technology, leaving an audit trail of the process and producing ‘smart’ evidence that researchers cannot unduly influence. It could also make the publication process more dynamic, with peer review, or even more micro-contributions, recorded on the blockchain. Finally, the process for awarding funding could be substantially improved through the use of blockchain by encouraging objectivity and relieving reliance on third parties for orchestration. For example, a Russian biotech firm, ARNA Panacea, recently successfully issued its own fixed-value cryptocurrency to crowd-fund a decentralized universal repository of clinical trials, diagnostic information, disease progression, and more. While throughput limitations of blockchain mean that it will never replace centralized systems and databases found in the scientific ecosystem, its revolutionary benefits in the areas of transparency, reproducibility, information dissemination, and researcher incentivization are significant. Going forward, we can expect that blockchain will play an expanding role in science – and knowledge creation more generally. A list of almost all Blockchain For Science projects can be found here. Sönke Bartling is the founder of Blockchain For Science (www.blockchainforscience.com) and associated researcher at the Humbold institute for internet and society. His focus is the blockchain revolution and what it could mean for science and knowledge creation. In general he is interested in developing and describing novel online tools and concepts for knowledge creation. Besides, he is a board certified radiologist with a broad clinical experience and a researcher in basic medical imaging sciences. He co-edited the living book http://www.openingscience.org/.